This is an easy recipe to prepare authentic and traditional Kerala style sardine fish curry recipe. You can take it as a side dish with Kappa (Tapioca) / hot Kerala rice / Pathiri / Porotta / Appams. Sardine, (popularly known as Mathi, Chaala in Kerala), is one the cheapest, popular and the tastiest fish available in South India. Sardines are rich in Omega 3 fatty acids, which is good to lower your LDL Cholesterol to prevent heart diseases and is also good for your skin and hair. The small bones of Sardine is good resource of calcium. Soak gambooge in half cup of water for 20 minutes. Cut each fish into 2-3 pieces and clean it thoroughly and rub them well with salt / rock salt to avoid the smell. Heat coconut oil in a manchatti / clay-pot and add mustard seeds. Add sliced shallots when you hear the crackling sound of mustard seeds and mix it till it changes color. Add chopped ginger, garlic cloves, sliced green chillies and saute until garlic cloves become slight yellow. Add sliced tomatoes and saute well until you get a nice aroma. Make #6 into a paste in a mixer with little water and add it to the pot. Rinse the mixer jar and add the rinsed water to the pot. Add sliced gambooge along with the water used for soaking, remaining curry leaves and salt. Add more water to the desired volume. Allow it to boil and add the fish pieces. Cook covered on medium flame till the fish turns soft and oil separates. Now open the lid and cook until the gravy reduced to half. Turn off the flame and cover the pan with the lid. Keep it idle for some time to blend the spices, souring agent and fish. Almost all fish vendors sell sardines, but only a few give it cleaned. Cleaning sardines takes time. The strong smell of sardine can stink your hand and even your clothes. Use an apron while cleaning sardine and after cleaning wash your hands with soap multiple times. If the curry tastes too sour, take out some gambooges back. Add more tomatoes to the preparation if you want to make it more tasty. Add chilly powder to make it more spicy. Frying sardine can make veggies go mad with you, because it has an extreme strong smell. Careful when you fry sardines, they have a bad reputation for its stink. View more fish curry recipes. 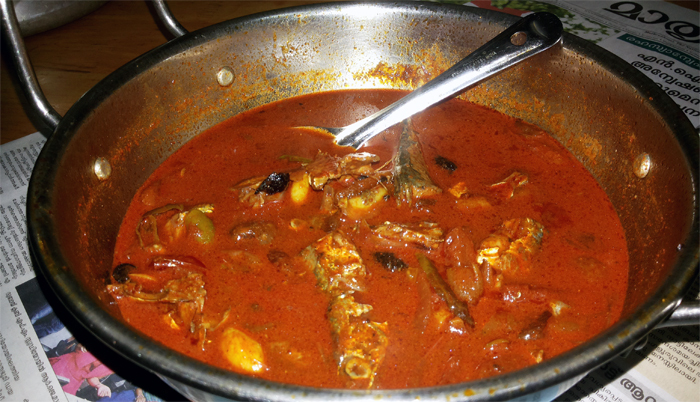 This entry was added on February 22nd, 2013 by Renoos in Non Veg and tagged with south indian fish curry recipe, sardine fry kerala style, sardine curry, fish curry, non vegetarian, how to make fish curry, mathi meen kulambu, curry, kerala sadine curry. Last revised on April 4th, 2018. This recipe is really superb. I tried it at home and really loves it. At my residence you have a new name “THE KITCHEN DOCTOR” . This sardine fish curry is simply the best ever and my God you should try this with soft kulcha’s its even more heavenly. Simply awesome!!! Looking forward to all of your recipes. Do you add fennel in sardine curry? Did you forget to mention ginger or is it the way it is? @Abdu: I am extremely sorry. Its not fennel powder but its fenugreek (Uluva) powder. Thanks for pointing out it. I have updated the post with the changes. Regarding the usage of ginger, definitely we will add ginger while preparation. Its mentioned on step 4. Sorry, I dont have an Idea. Try ebay (the closest I found is this.) or ask some of your friends in Kerala to bring it for you next time when they return from India. Awesome recipe, just made it! Hi I made it and it tastes good. Remembers grandmother’s sardine curry taste. This has come out very well.. perfect .. thanks for sharing..
@Nandini : Thanks for trying the recipe and dropping your feedback. Glad to know that our recipe was helpful for you. Wish you a Merry Christmas and Happy New Year in advance! Tried this out Yesterday. Came out Pretty Good. Really enjoyed it. Thanks for the recipe. Thank you so much Febina :). Happy New Year!